Be the first to share your favorite memory, photo or story of Rosemarie. This memorial page is dedicated for family, friends and future generations to celebrate the life of their loved one. 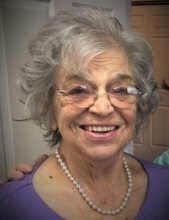 Rosemarie Kordiac, age 88, of Northfield, Ohio passed away peacefully on April 11, 2019. She was "the baby" of her family, born on January 3, 1931 to the late John and Elizabeth Bango. Rosemarie grew up on Ambler Street in Cleveland, Ohio and was a 1949 graduate of Holy Trinity on Woodland Avenue. In 1952 Rosemarie married Gerald. It was at a dance six months prior to their June 14th wedding that Gerald first saw Rosemarie and at that time told his friends "See that girl over there? I'm going to marry her." And he did. In 1962 Jerry and Rose moved to Northfield where they raised their family. Jerry and Rose enjoyed 64 years of marriage before his passing in 2016. She spent most of her last 3 years living in Toledo, Ohio with her daughter Barbara and favorite son-in-law Mike. Rose held many positions and was a proud member of her Wednesday night TOPS club, having earned many awards while gaining close friendships with its members. She was proud of her Hungarian heritage and enjoyed everything Hungarian, from dancing the csadash in her younger years to preparing many of the traditional Hungarian dishes. Rose lived all her days with a prayerful heart and sweet spirit, always putting others first. She loved her Cleveland Indians and Cleveland Browns. Rose is preceded in death by her husband Gerald; and sibling Louie, Betty, Johnny, and Mary. Surviving are her three children Michael (Karen) Kordiac, Barbara (Michael) Johnson and Robert Kordiac; grandchildren Matthew (Dana) Johnson, Katie (David) Schaff, Robbie (Desiree) Kordiac, Heather Kordiac and Tyler Kordiac; 7 great-grandchildren; nephews, great-nieces and great-nephews; sweet cousins and many dear friends. Friends and family may visit at the Walter Funeral Home, 4653 Glendale Avenue, Toledo, Ohio on Sunday, April 14th, between 2 p.m. and 4 p.m. Burial will take place in Northfield-Macedonia Cemetery in Northfield, Ohio on Monday, April 15th, following a time of visitation for family and friends beginning at 10 a.m. and concluding with the funeral service at 12 p.m. at the Ferfolio Funeral Home, 356 West Aurora Road, Sagamore Hills, Ohio. The family would like to thank the nurses and aids of Hospice of Northwest Ohio and Promedica Ebeid Hospice for their compassion and care. To send flowers or a remembrance gift to the family of Rosemarie J. Kordiac, please visit our Tribute Store. "Email Address" would like to share the life celebration of Rosemarie J. Kordiac. Click on the "link" to go to share a favorite memory or leave a condolence message for the family.